Do Children Who Reverse Letters Actually See Them Backwards? Children are introduced to letters when they learn to read, spell, and write. And although most children are able to differentiate between similarly shaped letters, such as b and d, or q and p, early in the learning process, some students struggle with reversing letters as they read or write them. Difficulty with letter reversals is not uncommon; however, when parents notice that their child is having a problem with letter reversals, sometimes it causes alarm. Many parents assume letter reversals are automatically signs of dyslexia or a learning disability. In many cases, reversing letters early in the learning process is simply a matter of trial and error while acquiring a new skill. Imagine looking at an alphabet through a young child’s eyes and trying to remember what each letter looks like and sounds like. It’s easy to make mistakes, including letter reversals. A ‘b’ simply looks similar to a ‘d‘ for a new learner. With practice and coaching, most children will quickly improve. In some cases, children who reverse letters persistently actually have dyslexia, and parents will need to seek proper professional help. But in often-overlooked cases, children are reversing letters because of a learning-related vision problem. Does this mean children who reverse letters because of a vision problem actually see the letters backwards? Not quite. Children who reverse letters and numbers do NOT actually see them backwards. Letter reversals are a symptom of poor laterality and directionality concepts. This means their vision is not yet trained to process the letter in one particular direction, and they may require vision therapy (also known as vision training) to correct the problem. Parents should also note that just because a child writes a letter correctly does not mean the child is processing the letter accurately and easily. Children with symptoms of letter reversals often do not reveal these symptoms through their handwriting; sometimes, only when asked to decode and identify letters, will children show poor ability. It is possible that weakness in laterality and directionality, which manifests in reversing letters, can slow work down and cause confusion of word meanings. Poor eye tracking is also linked to problems with letter reversals. So while children who struggle with letter reversals are not seeing letters backwards, they are having trouble processing the letter visually, which contributes to learning difficulties. The good news is, vision therapy or vision training usually results in rapid improvement. If your child is reversing letters, click here to see if he or she might benefit from a comprehensive exam, or contact us to schedule an exam in our Olney, MD office. Can Vision Therapy Treat Signs of Dyslexia? When a child has difficulty learning to read, despite normal to above-average intelligence, teachers and parents often suspect that the child may have a learning difficulty, such as dyslexia. 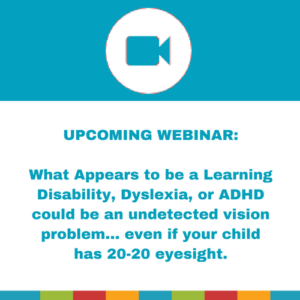 However, what looks like a learning disability might actually be an overlooked vision problem. Many children are misdiagnosed as dyslexic without thorough vision screening by an optometrist trained in functional and developmental vision care. Standard eye exams will not detect problems that affect reading. Some of the most commonly recognized signs of dyslexia include transposing letters, writing words in reverse order, and letter reversals. So when a students’ writing includes letter reversals, the adults in their lives may jump to the conclusion that the child is dyslexic. Most people are not aware of other possible diagnoses that can be confused with dyslexia, included vision problems. Other signs of dyslexia that could also be symptoms of a visual problem include losing place while reading or reading words that are not on the page. The child may also complain of eyestrain and headaches, and he or she may resist reading or attempt to avoid reading altogether. While these signs and behaviors are all-too-often assumed to be dyslexia or other learning disabilities, the student may not actually have trouble learning. Professionals who are trained to recognize visual problems may suggest an alternative diagnosis — poor visual processing skills. The good news is that visual processing skills can be improved dramatically and quickly with vision therapy. So while vision therapy does not treat learning disabilities or reading difficulties due to dyslexia, vision therapy does treat vision problems that interfere with reading. If a child does have true dyslexia, that will need to be addressed by the appropriate professionals. 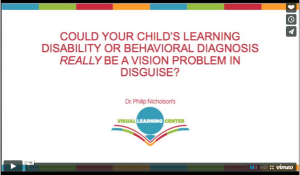 But vision therapy can help develop the visual skills the child may be lacking. In this way, reading interventions provided by other professionals will have the best chance of success. On the other hand, if teachers or parents suspect a child is struggling with dyslexia, common red flags such as letter reversals might not be symptoms of dyslexia at all. If these symptoms turn out to be due to a vision problem. vision therapy will help significantly. If your child has been diagnosed with or suspected of having dyslexia, click here to learn more and take our online assessments.